Need something that appeals to all ages? Drawstring backpacks are very popular and affordable as well. Can be used to hold other items or just for stuff. With your logo on the side, people will be proud to carry this bag to all sorts of events. Great for runs, walks, teams and more. 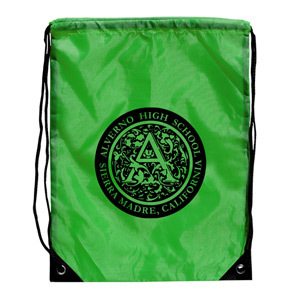 Booster clubs and activities are also using drawstring bags as fundraisers. Made of 190T Polyester, easy to take along, empty they lay flat, requiring little storage space. Metal grommets help to resist tearing and secured by heavy duty nylon braided drawstring cord. Imprint are is 9″ h x 8.5″ wide. Bag colors are green, navy blue, royal blue, sky blue, red and yellow. 150-249 are 1.99 ea; 250-499 are 1.95 ea; 500-999 1.89 ea, 1000 or more 1.75 ea. Set up is 47.50 with one color imprint. Show your spirit in a wild way. Rally Hawk and Spirit Hair. Imprinted on the band, this is sure to be a popular item with your student body. Great item for booster club fundraising. Available in a wide variety of stock colors: red, black, pink, light blue, dark blue, orange, yellow or green or do custom colors. Rally Hawk # SMHS-001, min is 25 imprinted. 10.95 ea. 49.00 set up for one color imprint. Order today for this season’s fan events. Spirit hair #VRHS-001, min is 25 pieces, 9.45 ea, 49.00 set up one color imprint. Spirit hair attached to a headband. Have some fun, build spirit and support your team. 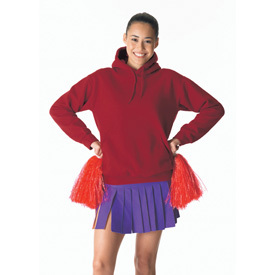 Perfect for parades, fund raisers, festivals. parties, Mardi Gras events, carnivals, exciting the crowd, and showing support. Matching headbands.